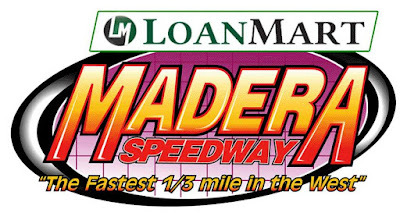 MADERA, CALIFORNIA (December 16, 2016) – The MAVTV-televised LoanMart Madera Speedway has finalized the Late Model portion of its 2017 schedule with eight race nights to feature both LoanMart Late Models and 51FIFTY Jr. Late Models again next season. All eight race nights will be televised after a 2016 television package that included 16 one hour episodes of "Madera Racing". The two Late Model divisions will co-headline the March 11th Madera Speedway season opener followed by events on April 29th, the May 27th Tribute to Armed Forces, June 17th, July 29th, August 26th, September 23rd, and the 4th Annual Short Track Shootout on October 6th and 7th. The March 11th and July 29th 125 lap LoanMart LM races will pay $5,000 to win while the Short Track Shootout continues to be a $10,000 to win race. The standard format for the LoanMart Late Model Series is 100 laps over two 50 lap segments while the Short Track Shootout will be 150 laps in 2017 with a break at the 100 lap mark. For the Jr. Late Models, 2017 will mark the second season for the world's first full size stock car series for drivers ages 10-16. The Jr. Late Models share the exact rule book of their Open LM counterparts except for a restrictor. The drivers will face a new challenge with races increased to 75 laps with a 50 lap opening segment followed by a break for interviews and car adjustments before a 25 lap final segment. "The concept for the Jr. Late Model Series is something I've thought about since 2009, as I believe a restricted late model is a great place for a youngster to hone their skills in a car they can move up with throughout their teenage years," promoter Kenny Shepherd said. "We are proud that we have built a series where talent can shine in the LoanMart Late Model Series, and we intend to do the same for the 10-16 year old crowd with the Jr. Late Model Series on MAVTV." The complete Madera Speedway 2017 schedule will be released on Christmas Eve. Race fans can catch up on LoanMart Madera Speedway racing with "Madera Racing" airing Thursdays on MAVTV at 8 p.m. Eastern / 5 p.m. Pacific. LoanMart Madera Speedway racing is also available on the LucasOilRacing.TV app. The eighth and final round of the 2016 Jr. Late Models will be broadcast next Thursday as the final broadcast of the year. Wenatchee, WA (December 13, 2016)­­–Officials with the Northwest Super Late Model Series in partnership with tracks in Washington, Oregon and Idaho have set the 2017 schedule of events. Entering its fourth year of competition, the NWSLMS is the premier super late model series in the Pacific Northwest. The series opens the 2017 campaign on April 29 with the Leonard Evans 150 at Wenatchee Valley Super Oval. The race marks the first of two stops at the North Central Washington facility operated by Garrett Evans. Wenatchee Valley Super Oval is the site of the 2017 championship event, the Neal Newberry 125, scheduled for Sept. 23. Spokane County Raceway’s half-mile Super Oval hosts the series on May 20 with the running of the Park Model Homes 125. The series returns to the Inland Northwest track on July 29 for a second 125-lap main event. For the first time in series history Tenino’s South Sound Speedway hosts a 125-lap event featuring the stars of the Northwest Super Late Model Series. The June 3 race is the first of two new ventures for the NWSLMS in the month of June as the teams invade Douglas County Speedway on June 17. Also featuring a 125-lap main event, the Roseburg facility marks the return of the series to the state of Oregon for the first time since its inaugural season of 2014. Also hosting the series for the first time in its history will be Meridian Speedway. The quarter-mile facility located just west of Boise features the top teams in the Northwest competing in a 125-lap main event on July 8. Yakima Speedway brings back the famed Sun City 125 super late model showcase on August 19. The race is the only stop at the Central Washington speed plant during the 2017 season. The event marks the fourth consecutive season the half-mile track has hosted the series. Drivers competing on the series in 2017 will face over 1,000 laps of competition stretching over six-month span.